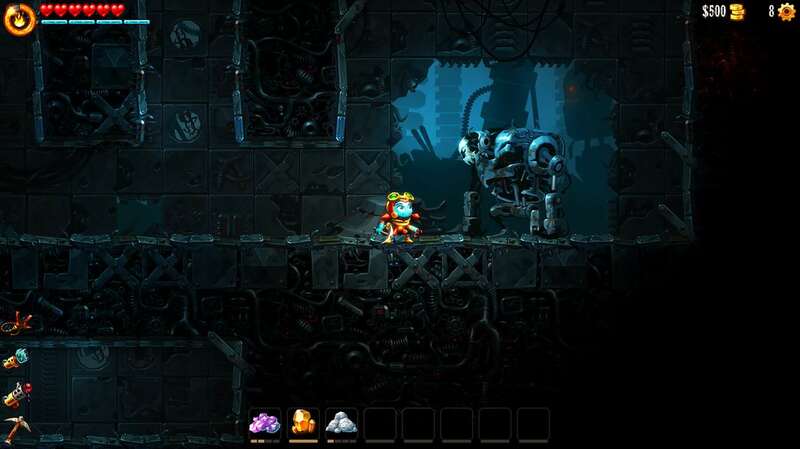 More than 3 years ago, Image & Form Games rocked up on to Xbox One with the rather delightful SteamWorld Dig – a platforming miner that delivered a ton of Metroidvania ideas and a rich steampunk world full of mystery. Now though, the guys are back… this time with SteamWorld Dig 2. After releasing on other formats a few months ago, we now find the opportunity to dig again on Xbox One, as SteamWorld Dig 2 sees you once more head under ground to earn your riches and take on numerous foes; digging, exploring and allowing us to be wowed by the Metroidvania-styled world that the SteamWorld Dig world is known for. Coming with a price of £16.74, anyone who enjoyed the previous game – that’s us btw! – or are just after a new adventure, will no doubt be enthralled by what Image & Form have done again this time round with the sequel. In fact, if you have ever had any temptation to grab a pickaxe, want to take in a lovely tale about a lone steambot in search of her friend, or ever wished to explore a land filled with dirt and destruction in the hope of uncovering riches, then SteamWorld Dig 2 is the game for you. The stunning visuals that hold all of this together just makes that even more appealing. Get yourself over to the Xbox Store right now and ensure your download of SteamWorld Dig 2 is put into action. We’re pretty certain you’ll like what you find.